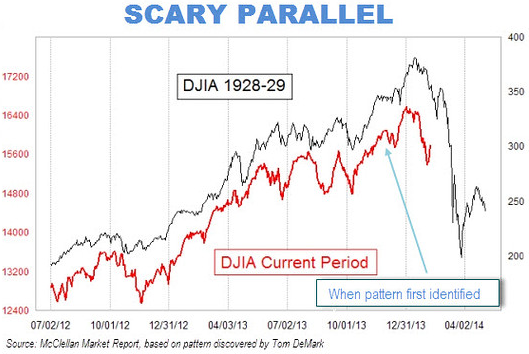 In early 2014 charts were circulating around the internet comparing the 2014 market to 1928-1929. One such chart is shown below. The below chart was taken from an article that highlighted the fallacy of these comparisons. In fact, this type of scare tactic infiltrated the main stream media where a MarketWatch.com article warned about the similarity of the '28/'29 market to that of 2014 and that “trouble lies directly ahead.” Since that 2014 article was written, the S&P 500 Index is up over 30%. 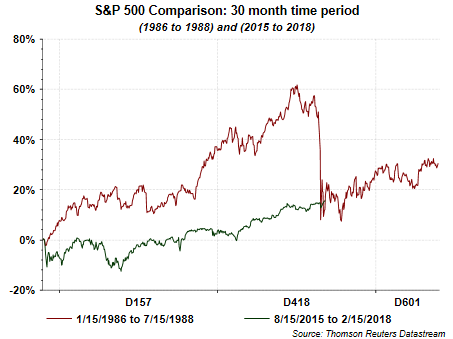 Well, just yesterday, the following chart began making the rounds comparing the current S&P 500 Index level to that approaching the 1987 correction. I ran across the chart in a tweet that can be viewed at this link. Just looking at the above chart would certainly make one believe a correction might be imminent. However, because the time periods are so far apart and the actual index level numbers are so different, the percentage move between the two time periods is much different. 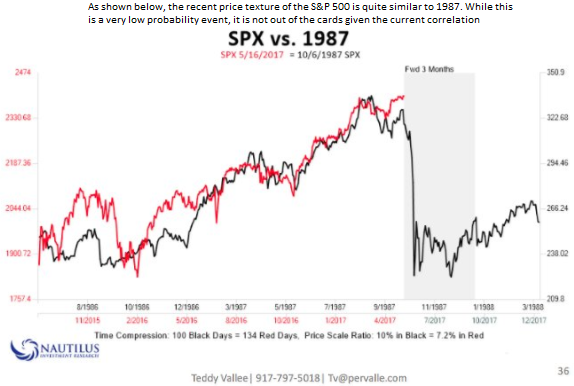 As I show below, when looking at the percentage move, the current market looks nothing like that of the October 1987 market. For investors, do not get fooled by these chart comparisons that are not comparing apples to apples and that may result in one making inappropriate investment decisions. Results of the "Trump Trade"